Let’s face it, traveling with kids is hard. Admitting this fact doesn’t make you a bad parent. On the contrary, it shows that you and rest of the parents struggling are looking for a way of making traveling with kids possible and easier. A comfortable kid is a happy kid, and the only the best toddler travel bed will make this possible. Even though we hardly agree on parenting styles, we believe that this is the one thing we can all agree on. A travel bed is light thanks to the superior construction which makes them easily foldable when not in use. The lightweight makes it possible for you to travel wherever without feeling the extra weight. Your child will be able to sleep well even in an unfamiliar place because of the comfort afforded by the travel bed. They can offer a proper padding keeping your child comfortable when asleep. The other reason why you need to get a travel bed is cleanliness. 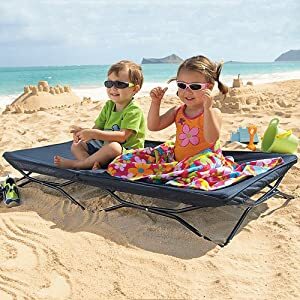 A travel bed gets your child off the bare ground, and he or she won’t touch dirt (when the bed had a mesh), and for infants, they won’t touch dirty surfaces. Besides padding, a good travel bed for toddlers come with air meshes or steel rods that keep toddlers off the ground. These beds are therefore ideal for home use and also games in the park or the backyard. For security purposes, some beds have the mentioned air meshes while others have raised rails all around. These features mean that your baby will sleep or play in a safe environment. If you are looking for a travel bed for your toddler, you’ll come across one big problem – making a choice between one bed and the other. By not getting a portable travel bed, you increase your chances of having a fussy baby on your lap and throughout your journey. But, traveling with kids doesn’t have to be horrible. Even though kids get fussy naturally, especially in new surroundings, a level of comfort/ familiarity ends the fuss. A toddler travel bed is portable, and you can travel with it to family outings or camping expeditions. You can also carry the bed to sleepovers and the day care. What makes this Regalo My Cot Portable Bed the best for your baby? This cot has a frame constructed using durable steel. It has a canvas reinforcement that makes up the bed liner. The canvas is strong and will last a long time. Set up is easy and you can also fold it with ease. It folds up into a fraction of its open size meaning that it won’t take up much space when traveling over long or short distances. The carry case makes traveling and parking easy. The steel construction makes it very light contributing to its portability. The cot weighs 6.2 pounds. It meets the current allowed safety standards for toddler travel cots. The cots construction using nontoxic materials is the reason for its JPMA certification. It also meets the ASTM safety standards, and you can trust the cot with your children. As mentioned above, set up and putting the cot away is easy. The cot measures 48 x 26 x 7 inches, and it can hold children weighing a maximum of 75 pounds and kids less than 52 inches tall (2-5-year-olds). The cot’s cover is easy to clean after every use. It is machine washable, and you can wipe it down with a warm cloth soaked in warm soapy water. It is lightweight and portable. Fits into the convenient case quickly. Doesn't take up much space in your car. It lacks sufficient padding which makes it a bit umcomfortable. Not very big, make sure to check the size. We can all agree that kids are messy. Without a form of control that satisfies a child’s needs or make them feel comfortable, he or she will just act up, create a bigger mess, get cold and dirty. If your child is in their ‘terrible two’s’ phase, then you need to get a portable mattress. You require a mattress that works well for toddlers when at home and when you travel. A mattress that meets your needs is The Shrunks Toddler Travel Bed which won the Babbles Award. Whether your child is going to a sleepover, traveling with you out of town or transitioning to a bigger bed, this air mattress’s got the magic. In the pack, you’ll have an air mattress, a carry bag, and a Jetaire electric pump. The Shrunks Toddler Travel Bed Portable Inflatable Air Mattress Bed for Toddlers comes with a two-year limited warranty. Its signature sheet-tuck feature means that it fits all standard crib-sized sheets. It inflates in about 30 seconds, and it comes with a durable nylon bag which makes for easy transportation to a friend’s or an out of town trip. It is safe. This mattress is phthalate, BPA, AND Lead-free. The trademarked security rails prevent your child from falling off when he or she is asleep. Easy to inflate and deflate - comes with its own pump. It's comfortable for your toddler to sleep on. Compacts small and fits inside a large suitcase for air travel. The plastic smell is quite strong. Due to plastic material, your toddler can feel cold, so be aware to put enough blankets. As the name suggests, this travel crib is light. It is, therefore, easy to carry around. It weighs 13lbs. It is the perfect travel solution for kids aged 0-3 years. Like most parents, we find it hard traveling to our friends’ or our families when we have infants. This is because we have to consider the sleeping arrangement for the baby or babies. Well, thanks to this BABYBJORN Travel Crib Light, we no longer have to make up excuses for not visiting out loved ones. The crib comes with a bag whose smart design makes it easy to carry and stow away in any available baggage space. The legs automatically unfold, and the crib stabilizes immediately you put in the mattress. The built-in base plate keeps the crib standing firmly on the floor, and your baby will sleep safely. The mattress is soft and comfy creating a cozy space for your baby to sleep on. You can use it at home or when traveling. The crib’s soft and airy mesh fabric makes it possible for your baby to breath comfortably. The hook-and-loop attachments allow for the mattress to stay in place. The mesh is see-through and you can keep an eye on your child whether they are sleeping or playing. You shouldn’t worry about the messes babies make because both the mattress cover and the crib’s fabric are removable and machine washable. The fabrics are safe having been tested and approved to be free of allergens and harmful substances. Your baby can chew on it. The mesh material is breathable, and so is the mattress. It is easy to set up and fold up for traveling. Removable and washable travel crib material for easy cleaning. Due to mesh side, the baby will be cold if you don’t cover them. Might be too small to some, make sure to check the dimensions before purchasing. Traveling with your toddler or infant just got a tad easier with this KidCo P4012 PeaPod Plus Infant Travel Bed. It is exactly what you’ve been looking for to keep your child comfortable and safe out of your home. It has a lightweight mesh which promotes air flow. The mesh also acts as an insect/ bug screen. This travel bed weighs 3.5lbs and folds easily into a compact size making for easy traveling. You can use it when outdoors without having to worry about safety from harmful rays thanks to the bed’s UV protection and anchor straps. These allow for ground attachment. This KidCo P4012 PeaPod Plus, Infant Travel Bed, comes fully-assembled. It has a sleeping pad snapped to the underside, and it doesn’t require any further assembly. You can fold it and store it with the sleeping pad still attached. Lightweight and easy to carry around to short or long trips. Compact and folds to fit a very small space even with the mattress. A large front zipper panel makes access to children easy. It lacks a sturdy frame. Not easy to fold back. One of the reasons why most parents avoid traveling with children is the fear of their child falling off and hitting an unfamiliar ground. There also is the fear of sleeping on a dirty surface. Apart from that, traveling and having to hold your child throughout, or sharing the small hotel bed is discomforting. However, all these worries end with this Leachco BumpZZZ Travel Bed. It has a beautiful design. Besides design, this travel bed has a design suited for your growing child. It is generously-sized but lightweight to hold your baby comfortably. It is made of 100 percent polyester, 100 percent Polyurethane Foam; Polyester 50%/Cotton 50%; Polyester 65%/Cotton 35%. It is lightweight and folds compactly making it the perfect fold and go travel bed. You don’t have to inflate it, and there aren’t additional equipment needed for it to work. The padded foam center and the cushioned outer bumpers make for an all round comfort and safety. You can use it when fully extended or when folded over for a lounge cushion with some double decker back support. The bumper padding and the center foam pad are easily removable and washable.​ This travel bed is perfect for home use as well. It is comfortable and fits big toddlers. Getting the good travel bed for your toddler is important in keeping your baby comfortable, letting them sleep when you leave home and letting your child play on a safe surface. Though the search for the best travel bed is tough, the five reviewed above should lead you in the right direction. Wondering which toddler travel bed we recommend to you – Regalo My Cot Portable Bed. It is lightweight and easy to fold and go. It has a sturdy construction due to durable steel constructed frame with a reinforced canvas bed liner. The frame is what makes the bed sturdy, yet lightweight and therefore able to hold up to 75 pounds. The canvas liner material is strong but easy to clean. A wet soapy cloth is all you need to clean it up. It comes with a matching sheet which is also easy to clean. It is safe and meets JPMA and ASTM standards. You’ll also like its low price.